I DON’T know how Halloween became an important event in the country. I won’t call it a “holiday” because the Catholic Church doesn’t recognize it as such. My siblings and I certainly never went trick-or-treating when we were youngsters. It was just an American event we would read about, or see by watching films or TV shows. Yet in the past few years, I’ve seen Halloween take on a more significant role in the lives of Filipinos, especially among the kids. Malls are packing in huge revenue from selling scary costumes, masks and accessories (e.g., pitchforks, pumpkin pails, glowing red horns, etc.) 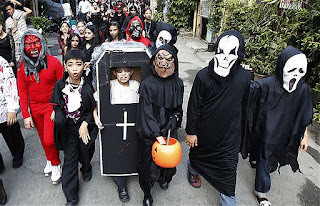 as Pinoy kids have learned to ape their American counterparts and go trick-or-treating in their respective neighborhoods. I was recently looking through some of the costumes at a popular mall and they don’t come cheap, mind you. For a mall that caters to the masses, the most reasonably-priced costume I found was about P500! For a lower-middle class family, that P500 already spells one cavan of unmilled rice! I heard one mom even try to dissuade her daughter from picking out some pricey but well-made superhero costume by saying, “Ay pangit yan! Pagtatawanan ka nina Apples!” (which I suppose referred to the child’s friend and their barkada). But the sweet kid held on so tightly to the costume, and refused to look at any other. I laughed quietly in my head, half-amused and half-bowled over by the extremely superb fashion sense of that little girl. And she was gonna stick to her guns no matter what! She didn’t care if Apples and her other friends did laugh at her. She wanted the costume. Period. Gads, I’d hate to be in her mom’s shoes. Of course, props goes to the mommies and daddies who still manage to make the costumes for their children. This is such a big deal especially among Americans; a mother or father’s reputation literally hangs in the balance until he/she has crafted the most unique or the wittiest “statement” costume for his/her kids. I’m surprised that some of my stateside friends still manage to find time to sew their kids’ outfits, and amazed at the distinct styles of the clothes. I guess they’re all scared of being branded “bad mommies or daddies,” and being talked about by the neighbors for “neglecting” their Halloween responsibilities. Hahaha! 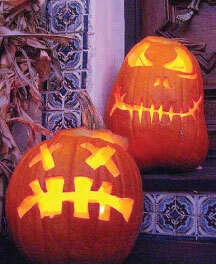 Said Greg Clement, “I remember as a kid how important it was to have a pumpkin in October. My wife, Kelly, and I were hearing a lot about East Coast farms that had no pumpkins. Then we saw on TV how badly Hurricane Irene had hit Paterson, and we knew we wanted to make sure the kids would have a happy Halloween.” What a swell guy! Back here at home, some local pet owners also got into the Halloween swing of things by dressing up their pussies and pooches. According to MSNBC Today, the Philippine Animal Welfare Society, or PAWS, put on a pet parade in a mall as part of its campaign to encourage pet owners to take better care of their animals. The pets were so cute in their delightful costumes even as some of the pet owners joined in the fun by dressing up, as well. Meanwhile, MSN News reported on the top 10 scariest movies of all time. Which of these are you watching this long Halloween weekend? My personal favorites which didn’t make the cut are Silence of the Lambs and The Omen. Ach! So, boo! Enjoy the Halloween break guys! Doing it all...and in high heels at that!